Everyone knows the legend of Lady Godiva--the woman who (in)famously rode naked on horseback through Coventry to relieve her people from unfair taxation. But why would a lady of the court take it all off and risk everything, including husband, home, and well-being? 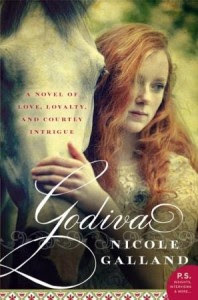 In this richly imagined retelling of an oft-told ancient tale, Nicole Galland gives us Lady Godiva in all her, um, glory, as she and her best friend (the Abbess Edgiva) and husband (Leofric, Earl of Mercia) embark on a misadventure filled with courtly intrigue, deceit, backstabbing, and romance. When I started this review, I actually had a higher rating for this book. Then I realized that I can't really think of anything positive to say about this book. Perhaps I'm being unfair, but this book fed into nearly all of my pet-peeves and, frankly, just irritated me. I have a degree in Medieval History and I'm familiar with Lady Godiva, which is why I was looking forward to reading this book. Lady Godiva was a real person and was one of the only female landowners in England at the time of the Norman Conquest. However, nearly all historians agree that her legendary naked ride was no more than that--a legend. Sadly, it didn't take long for this book to get under my skin. Galland may have researched the larger aspects of this story, but not the finer details. My first notice of this was after her fifth or sixth time of talking about Godiva wearing silk in the first few chapters of the book. That just didn't seem right to me so, after less than 30 seconds of searching on the internet, I found several sites proving her wrong. Silk was not widely used in southern Europe until the 13th century and not used in England until the 15th century, nearly 400 years after this story takes place. When Galland made the decision to mention incessantly the fact that Godiva wore silk, she should have taken the time to research that detail. There many other small mentions, such as priests no longer being able to marry (again, this didn't happen until the Fourth Lateran Council in 1215, over a century later), that should have been corrected before this book was published. The problem is that once an author shows that they are not paying attention to the historical record, they're entire book becomes questionable. There was also a bizarre facet of this story regarding pagan beliefs versus Christian beliefs. While I have no doubt that pagan practices were common among the peasantry at this point in history, I find it hard to believe that a noblewoman who was raised in a convent would also follow these practices. But, more importantly, Galland seems to be hitting the reader over the head with this and it is obvious she is trying to make some point about it, but I could never figure out what that point was! The character of Godiva is just downright unlikable. She coarsely and blatantly uses her sexuality to bend men to her will and doesn't think twice about meddling in other people's lives. There is a very bizarre middle-school subplot of her trying to fix up her friend (an Abbess!) with a nobleman that does nothing but lower Godiva even more in my esteem. Sadly and ironically, this plot tends to be more interesting than Godiva's story (which isn't that hard a feat....). "How bad was the damage? Have you marred my chances to convince him in a more straightforward manner?" Edgiva was not accusing, only strategizing. "Welllll [sic]..." Godiva said, shamed, "he ordered Aldred to refute me." "Ahhh." A dry smile. "So you wooed Brother Aldred too." "I did," Godiva confessed. "Although with him I was not woo-ish." It was passages like this that led me to shake the book and say, "Pick a century and stick with it!" I also believe that there are words--think of them of the "challenge" words for the SAT--that an author should only be able to use once per book, and only if the general prose of the book supports that level of vocabulary (which this book does not). One such word is obsequious. The first time it came up in this book, I laughed to myself and thought that someone had just gone to their Roget's Thesaurus. But then the word was used again, and again. In total, she uses "obsequious" four times and "obsequiousness" once--and every time stuck out like a sore thumb. The fact that I kept count should tell you something. Finally, there is what I consider the greatest sin of this book. Galland tells instead of shows. There are pages of explanation of some point or another that do absolutely nothing to move the story along and succeed only in boring the reader. Truly, the only thing that kept me reading this book was the overall arc of the story (which was pre-determined by legend) and then the Godiva's ride was completely anti-climatic. To add insult to injury, the book finishes with another long explanatory dialogue section which does nothing to redeem the 200 or so pages that came before it. I went into this book with great expectations and that may be partly responsible for my reaction to this book. However, I just can't get past the technical, factual and stylistic problems with this book. This is the lowest rating I've yet given to a book that I've finished, but it is the first book that I haven't been able to find one positive thing to say about it. Ultimately, I feel that this book should have and could have been much better than it was and that, sadly, is this book's greatest flaw. This review is part of a blog tour by TLC Book Tours. I received a copy of the book to read and review. However, all opinions in this review are mine and mine alone. I received no other compensation. I have just downloaded this book and so have yet to see if I agree with this reviewer's subjective opinions. However, as a writer myself, I do wonder about the comments regarding a lack of detailed research - and this leads me to a larger issue with book reviews like this in general - i.e., ones that make factual claims about content with very little if any authority. (In the interest of full disclosure, I will say that I have read Galland's other books and enjoyed them. One of the elements I found most enjoyable was her attention to detail - and how almost obsessive she is in her research.) My point is that I feel it is one thing to comment on what one did or did not like with respect to style or dialogue, etc., but quite another to suggest - based on a 30-second internet search - that an author known for her detailed research has somehow dropped the ball here. Again, I am just beginning this book so cannot comment overall on style, but I do question a reviewer's judgment when she is satisfied with the superficiality of a 30-second internet search to back up claims of inadequacy in an author's research. I'm sorry if you felt that I had no place to comment on what I found to factual inaccuracies in Galland's book. By saying that it took my 30 seconds to find sources that contradict details in her book, I was not saying that I spent a total of 30 seconds in "research." Instead, I was pointing out how easily it was to find information on the subject of silk in medieval Europe and England. However, I do not carry the burden of proof on this--after all, I did not write this novel. If you choose to question my judgment, then that is your choice. As I said, this review is mine and mine alone. Sorry this one wasn't your cup of tea. Thanks for your thoughts and being on the tour, though. Darn, sorry this one didn't work for you, but thanks for being a part of the tour.